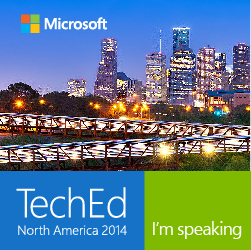 I’m thrilled to announce that I’ll be speaking about Lync at TechEd North America again this year! I’ll be presenting my Understanding How Microsoft Lync Server 2013 Leverages the Complete Microsoft Infrastructure Ecosystem session from Lync Conference 2014 in Houston as part of the 20 other Lync sessions in the Office Servers and Services track. I’m looking forward to seeing folks interested in Lync from all over Canada and the USA again, and in addition to my breakout session I’ll be working the Microsoft Lync booth and at the Ask the Experts event. I’m speaking about Lync at TechEd 2013 North America and Europe! This entry was posted in Events on April 3, 2014 by Justin Morris.